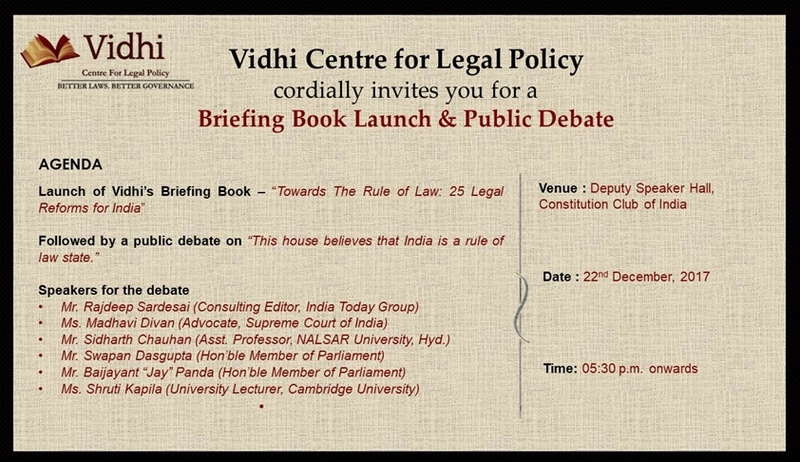 Vidhi Centre for Legal Policy will celebrate its fourth anniversary with the launch of its fourth briefing book titled ‘Towards the Rule of Law: 25 Legal Reforms for India’. The event shall take place from 5:30 pm onwards on 22nd December at the Deputy Speaker Hall, Constitution Club of India, Delhi. The launch of the book shall be followed by a public debate on the topic ‘This house believes that India is a rule of law state’.